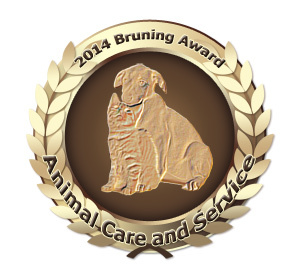 The Bruning Animal Care Awards gives notice of people that are working hard to help the animals, and who deserve recognition for their efforts. This page is dedicated to the people who make this world a better place, who fight to protect animals, who care for them, who make sure they are are fed and safe. This page is dedicated to the good guys. I have created an award to give to these people to acknowledge their dedication and hard work. Every year this page will be updated, hopefully with a bit of information about them and what makes them so special. This is what the award looks like and will be available to the winners to display however they like. If you wish to see the fullsize image, just click the thumbnail on the left. Showing our appreciation is the very least we can do to encourage people to continue working to help animals and protect our environment. Hope for Paws is an animal rescue organization based in Los Angeles, California. Their work saves the lives of animals who desperately need to find the kind, loving homes they deserve and the people at Hope for Paws will foster the animals they help until the right home is found. Wang Yan of China had his dog go missing back in 2012. While searching for the pet all over Helong town in Jilin province, his search eventually led him to a local slaughterhouse. While he didn’t find his animal what he saw moved him to take on a new cause. Using his significant personal wealth to purchase the slaughterhouse, he converted it into an animal shelter – changing it from a place of pain and death to one of healing and hope. Since then, he has spent over a million Yuan on the shelter and has saved over 2000 dogs from being slaughtered. This man deserves our respect and admiration. Well done Mr. Yan! Every year there is an annual festival in Yulin, China where an estimated 10,000 dogs are killed and consumed every year. Often these dogs are stolen animals and are subjected to absolutely brutal treatment, sometimes dying in agony while crammed into cages awaiting their fate. Often these animals are intentionally injured prior to being killed due to the cruel belief that pain enhances the flavor of the meat. Naturally this brutal spectacle is resisted by activists who do what they can to save as many dogs as possible. Market vendors are willing to sell the dogs to activists trying to save them, often at inflated prices, often taunting and threatening to hurt the animals if they aren’t paid. You can find more information on the festival here and here. This year’s Bruning award goes to Yang Yuhua from Chongqing, China. Yang has saved over 130 dogs this year to protect them from the festival, and has been going above and beyond for over 12 years – she currently houses over 500 stray dogs on her dog farm where she cares for the animals. Regardless of a person’s stance on the ethics of eating dog meat, these animals are still living beings capable of feeling pain. The manner in which these animals are treated is both grotesque and inhumane. The vendors promoting how this “festival” tortures animals should be deeply ashamed of themselves. Every year there is a campaign to suspend the festival both at the festival as well as online (for example #StopYulin on Twitter), please consider giving your support to help stop the cruelty that this festival embodies. Every year about $19 Billion Dollars in illegal wildlife trade occurs. Rhinos, elephants and other animals are facing extinction as every year their numbers drop. Three elephants are killed every hour, every single day. These numbers are simply not sustainable. As we join together to try to limit and prevent poaching, it’s important to remember there are men and women that spend every day out in the wild trying to protect these animals. It is an IMPORTANT job, and one which is worthy of our respect. Firstly, thanks go out to Ian Somerhalder (@Iansomerhalder) and the Ian Somerhalder Foundation. Your fans overwhelmed us with the majority of the responses we received. Secondly, we also want to throw appreciation in the direction of the Barbi Twins (@Barbi_Twins). Your voters also said a great deal to support and recommend you.